At the age of 42, Pauline de Meulan gave her husband the greatest gift that he could have wished for: a healthy son, named François after his father, a common practice at that time, but also after his brother who had died shortly after his birth two years previously, which today may seem an unfortunate choice. Twenty-two years later in 1837, the death of this young François inflicted on his father the deepest suffering of his entire life, despite the loss of his two wives, as this wound never healed. Until the end of his life, he talked of “this charming son”, “the charming person” that he had lost, whose face never left him. François had been brought up in the spirit of freedom and intellectual development that had characterised his parents. Had they not, between them, founded and drawn up the Annales de l’Éducation between 1811 and 1814, promulgating the innovative teaching methods of the Swiss pedagogue Pestalozzi, based above all on the love of children? Guizot had felt this strong interest in children from a very early age and it continued until he was very old. His son François profited enormously from it when he was very young, as can be seen in the letters exchanged between his parents. He was much loved but not spoilt and received a good education at the Collège de Bourbon, today the Lycée Henri IV, passed the entrance exam to the École Polytechnique and then studied law: “I am not trying to influence my son in any way; he has decided on his choice of career. The judiciary appeals to him and I accept this. When he is there, if he then becomes interested in politics, this will be an excellent starting point”. It is as if his father thought that he could succeed him in this domain as well as in the others. For he counted on him to guide his younger sisters and brother, since the death of Eliza Dillon in 1833, to fulfil the hopes of the family and perpetuate the name: “His future was my future; the future of my pride; the pride in the duration of an established family”. Their tender and trusting conversations would last forever, he was his greatest friend. It was for him that he bought Val-Richer in 1836, making him responsible for arranging and improving it. And it was there that the young François caught a cold, which developed into the pneumonia to which he would succumb, his lungs having the congenital weakness of the Meulan family that had resulted in the death of his mother ten years previously. His father endured his son’s final agony hour after hour, described in these heart-rending words: “I do not think he suffers much, yet suffering is imprinted on his every feature. I must not let my thoughts linger there. I will never be able to retrieve them”. “I heard his last sighs. They awoke me. I arrived in time to receive them, to see his eyes one last time. My poor child! He loved me so! He knew so well how much I loved him!” “I search all day for the obliterated face, the silenced voice of my poor child. It was still him. Nothing resembles such pure suffering, such total absence”. 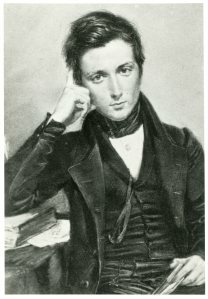 A portrait of the young man, that Guizot always kept in view, shows a narrow, slightly melancholy face with his father’s large dark eyes, considerably taller than him. His death was a public event. The Moniteur universel published the news; “His pleasant character and precocious intelligence had made him a dear friend to all the young people of Paris, and a precious student for those teaching science”. On February 18, in the Chamber of Deputies where Guizot was defending his project to reform secondary education, President Dupin salutes his colleague who “has shown, by his virtuous resignation, the extent of his courage in the face of grief.” And in a long article, Journal des débats describes the funeral in very moving terms. Being as sociable as his father, François had forged many friendships amongst his classmates. His father kept them on, giving much affection and protection to Joachim Meurand, who he employed in his cabinet and to Louis Béhier, who became the family doctor. When an old dog that had belonged to François was run over by a car, its death was a cause of great sadness to him.